Some centuries ago, the high society of the Inca civilization – high priests, scholars and the like – resided high above the Urubamba river valley, and faced the predicaments of illness, invasion and civil war, like many in that period. However, these particular classes lived in small numbers, without any real general population, nor an army in their mountain city. Without the capability to defend it, the best option was to abandon this retreat. These people headed down to Vilcabamba – a lost city which I intend to visit also – to survive. What they left behind was an indescribable marvel, completely forgotten about for hundreds of years, until its official rediscovery in 1911 by Hiram Bingham tracing Simon Bolivar’s steps in the search for Vilcabamba. 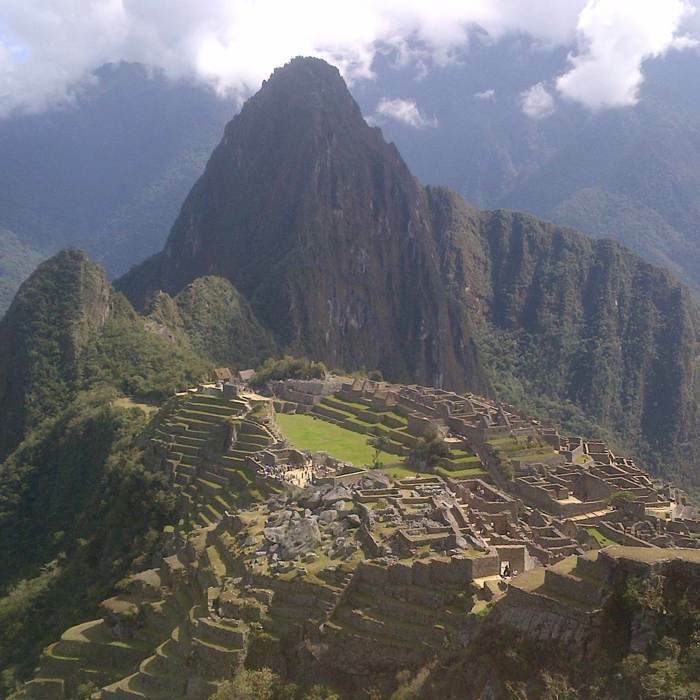 While he didn’t find his fabled lost city, some local boys did lead him to this city, Machu Picchu (Peru), instead; I can’t imagine the ‘jackpot’ feeling, nor that only a few local boys knew of its existence. The long awaited day arrived recently in which I would make my way up to this place. I took a bus with a group of Israelis from Cusco in the morning, which takes a fair few hours to pass through the winding mountain roads, so it’s a good idea to take snacks and motion sickness pills or gummies with you. We arrived at Hidroeléctrica about 2pm, from there you can walk to Aguas Calientes in about 2-3 hours following the railway track, or a little more if you stop to admire the views or dip in the river. It’s not tasking as the hike is fairly flat, but decent walking boots are recommended due to the terrain, and a torch will save you money in case you decide to spend a while en route; we arrived just as it was getting dark fortunately, but a few guys turned up at night after having paid for a guide and the train, you can’t see a thing out there when the sun goes down. We spent the night in Aguas Calientes where food, a beer and a place to stay are catered for. We left at 4 in the morning to start the hike to Machu Picchu – it is essential to take your torch then also, and I would suggest some sort of waterproof jacket or rain poncho, if not for you then for your backpack, sunblock for body and face, and sunglasses you’re gonna be out all day there in the sun and/or rain. It was 5am at the point we started heading up, scaling huge steps for 800m from the valley’s river, standing at about 1700m. I had to really zone out to battle my exhaustion, thinking about what’s at the top, what I’m about to see, what would the Incas feel on the way up to build it, to live there, what did Bingham feel when he first laid eyes on the place. After 40-50 minutes I arrived at the top, where the checkpoint stands. After passing, I walked off round the few steps that remained to the top, passed a couple of ancient household structures, and all of a sudden, there it is. I cannot believe what I’m seeing. The place is beyond beautiful, beyond belief, magical, mystical… This lost city in the clouds and its landscapes are completely breathtaking. Unfortunately, although I’ve tried, there are no pictures, no words to describe this place. While walking round the complex, exploring, hearing its histories, I feel totally connected, so overwhelmed, so close to tears. I feel the same way reflecting on what I saw, what I felt, even now writing about it I’m enjoying a little nostalgia trip. Of all the things that give me a strong sense of nostalgia, the recent memory of eventually having Machu Picchu revealed to me, is like nothing I’ve ever known.